Spoilers ahead for Ship of the Line! SHIP OF THE LINE tells the story of the first voyage of the U.S.S Enterprise NCC-1701-E, under the command of Morgan Bateson. Captain Bateson, a man from the 23rd century now living in the 24th, sees what no one else can see: that the Klingon Empire is building its forces and preparing to strike against the Federation. Seizing his one chance, Bateson takes the U.S.S. Enterprise on a mission to counter the Klingon threat, only to be thwarted by his enemy, a Klingon who has nursed a grudge against Bateson for decades. Standing in the way of Bateson's scheme and the Klingons' plan is Captain Jean-Luc Picard who, faced with the toughest decision of his career, must choose whether to take back command of the U.S.S Enterprise or let the torch pass to yet another next generation! 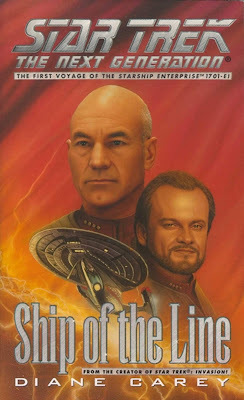 Ship of the Line is a book with a great premise: a follow-up to one of my favorite TNG episodes, "Cause and Effect." You remember it: The Enterprise gets trapped in a temporal causality loop, living the same day over and over again, with the Enterprise being destroyed in every loop until the crew is finally able to break out of it (interestingly enough, "Cause and Effect" predates Groundhog Day by just under a year!). 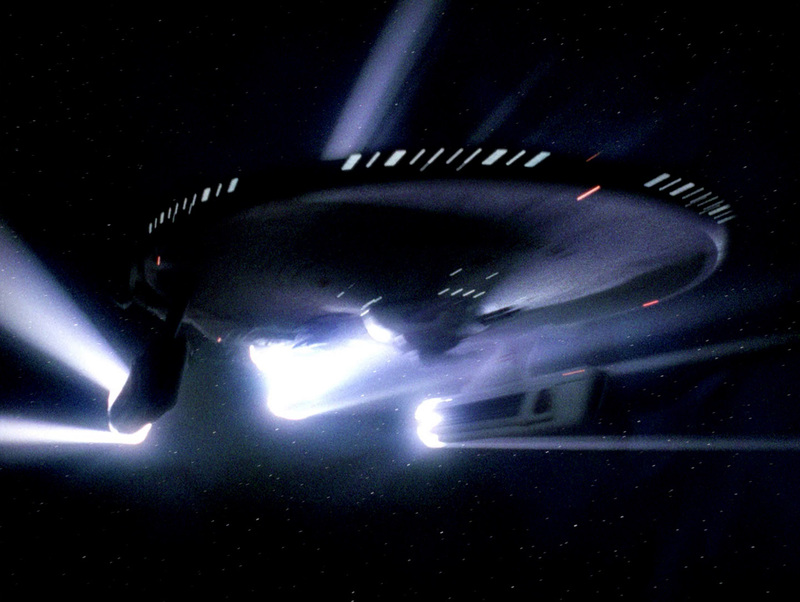 At the end of the episode, the Enterprise is hailed by the ship that has been colliding with them, causing their destruction at the end of each loop: the U.S.S. Bozeman, commanded by Captain Morgan Bateson. The U.S.S. Bozeman emerges from nearly a century in the past, bringing with her a captain and crew who must now acclimate to the 24th century. While this novel came out over a decade ago, I only recently got around to reading it. I'm not sure why; I loved "Cause and Effect," and was quite excited to get a follow-up. Plus, this novel features the first mission of the Enterprise-E! What's not to love? Well... plenty, as it turns out. For one thing, Diane Carey makes a number of mistakes in this novel that should have been easily avoided with just a bit of extra research. At one point in the novel, Picard comes face to face with Gul Madred, the Cardassian who imprisoned and tortured him in the TNG two-part "Chain of Command." During this interaction, Picard mentions his capture by the Borg, and refers to it happening after the events of "Chain of Command." 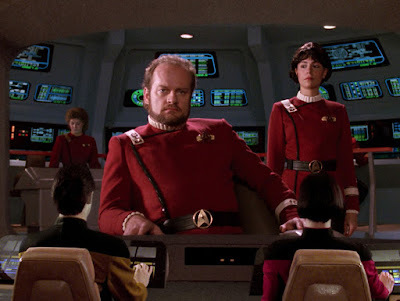 This occurred in the season three finale, "The Best of Both Worlds," while "Chain of Command" takes place in the sixth season, as anyone who is familiar with TNG could tell you. There are also a number of issues with Carey's depiction of elements seen in "Cause and Effect." For one thing, the bridge crew of the Bozeman that we meet in this novel is entirely male, with no female officers whatsoever. However, as you can see in the picture below, there were at least two female officers on the bridge when the Bozeman contacted the Enterprise after emerging from the distortion: to Captain Bateson's left, a lieutenant in the command division, and an engineering division officer in the background whose rank is too indistinct to make out. The Bozeman's crew in Ship of the Line bears little resemblance to what we see on screen in "Cause and Effect." Additionally, the bridge seems to be in pristine condition, corresponding to Bateson's line that the Bozeman left starbase "only three weeks ago." However, in Ship of the Line, the Bozeman has just escaped a brutal firefight, complete with the Trek tropes of severe damage and exploding consoles. There is no evidence of this battle in the episode. Finally, as we are told repeatedly in "Cause and Effect" (thanks to the time looping), the Enterprise-D is the first starfleet ship to chart the unexplored Typhon Expanse. However, in Ship of the Line, the Typhon Expanse is described as a border region between the Federation and the Klingon Empire, with a low-numbered starbase on its periphery and a great deal of traffic in the area. If this is the case in the 23rd century, I can't see how the Enterprise, nearly a century later, can be the "first starfleet ship to chart this unexplored region." Any one of these issues on their own would probably be forgivable, but taken together, they truly make me question whether or not Diane Carey took the time to become familiar with the source material. I certainly can't speak for the author, but to me, it feels as though she took the basic elements and shaped them to fit her story, rather than adapting what was already known. Ship of the Line is primarily an exploration of the character of Captain Morgan Bateson, and in that respect, it is at least sometimes interesting. I liked the idea of a man out of time who is both unsuited to the new status quo, but who also finds his particular skills and mindset useful when events require it. However, there were a number of elements of the story that simply felt out of place in the Star Trek universe. Diane Carey gives the Bozeman and her crew an overly "nautical" feeling, to the point of having the captain and crew actually quaff drams of rum while on duty. At times, I felt that Carey's experience with sailing had been shoehorned into the story, a complaint that comes up in other novels she has written as well. Another aspect I had an issue with was her characterization of Captain Jean-Luc Picard. Because of the loss of the Enterprise-D in Star Trek: Generations, Picard seems to have lost his nerve somewhat and isn't sure if he wants to command a starship again. However, after watching what basically amounts to a rerun of TOS's "Balance of Terror" on a holodeck, Picard learns his lesson and is ready to be back in the saddle. I understand that Diane Carey has a bit of a Kirk-worship issue, but the way it slights Picard's character rankles me somewhat. 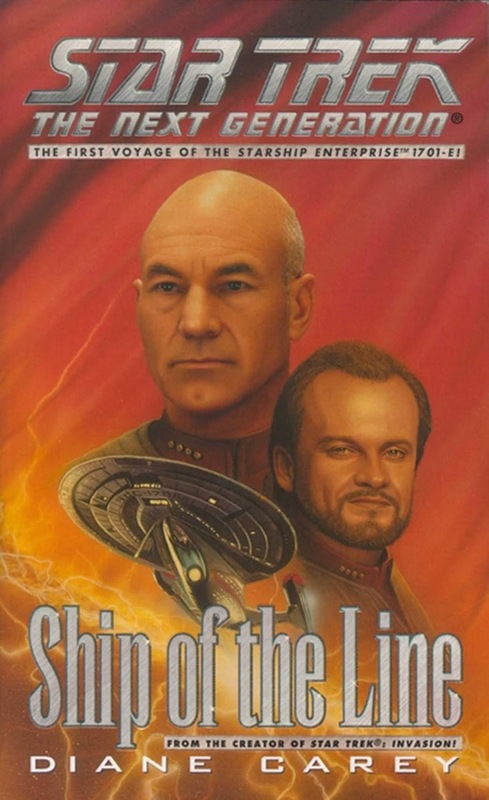 For the most part, I was disappointed in Ship of the Line. As a sequel to one of my favorite episodes, it fails on nearly every level. There were interesting aspects to Captain Bateson's story, but for the sheer amount of Trek lore that the author gets wrong, and how much of it just doesn't fit with Star Trek, I'm afraid I have to give poor marks to this novel. It pains me to do so, as I really wanted to like this one, but unfortunately it was not to be. By the way, for a much better (in my opinion) follow-up to "Cause and Effect" and the crew of the Bozeman, check out Christopher L. Bennett's Department of Temporal Investigations: Watching the Clock. My next review is for the first book in the I.K.S. Gorkon series: A Good Day to Die by Keith R.A. DeCandido.